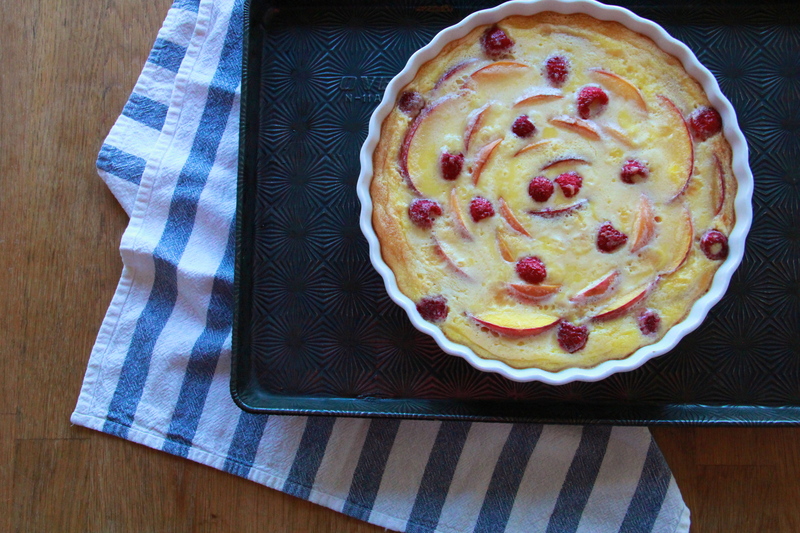 I killed so many bugs in the name of this clafoutis. So. Many. Freaking. BUGS. It all started with a lovely day of stone fruit picking last weekend. Unable (again) to restrain myself, our kitchen counter found itself beneath a good twelve pounds of freshly-picked and amazingly fragrant nectarines and peaches. Gorgeous fruit! Fresh and ripe and beautiful. I’ll make so much pie, I thought, and cobblers and custards and jams! Maybe scones? Parfaits? Who’s to say?! My heart (and my kitchen) was ripe with summer fruit potential. Except there were bugs. …So many bugs! They came out when I went to wash the great pile of fruit. URGH. They creeped and crawled and CREEPED. They were black and had pincers and were the size of golfballs (the last part might not be true). I screamed. I swatted. I put on my rubber dishwashing gloves and went at them, dancing and dodging around on my tippy toes, shaking and wriggling and trying not to actually touch the things. I’m not proud. I threw one out the window. I tried to drown some in the sink (don’t tell PETA), but they crawled back up the drain. They had to be smashed. (Keep the change, ya filthy animal.) It was traumatic for me (but probably more so for the bugs) and I’m getting itchy just talking about it. At any rate, in the now famous Battle Of The Bugs, there were casualties. Mostly of the insect variety, but we lost a lot of good peaches out there. 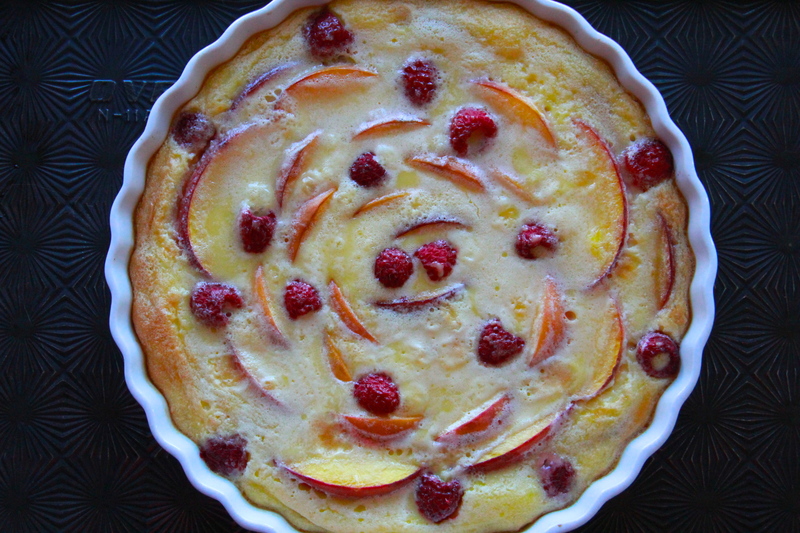 There was plenty of bug-free fruit left, though, and I showed those bugs who’s boss by making clafoutis (actually I did it by smashing them to smithereens, but I’m trying not to come off as a terrible person and also the clafoutis makes for a prettier picture). Let’s fire up the citronella candles (and bring some swatters and maybe a can of RAID — fine, forget the RAID) and eat this al fresco, in fat slices dusted with confectioner’s sugar. We’ll crack some wine — pink sounds good. We’ll pour some out for our bug friends (enemies), gone but not forgotten. Heat oven to 350 degrees. In a large bowl, whisk together the sugar, cornstarch and salt. Add the heavy cream, eggs, yolks, and extracts, whisking well to smooth and combine. Set aside. 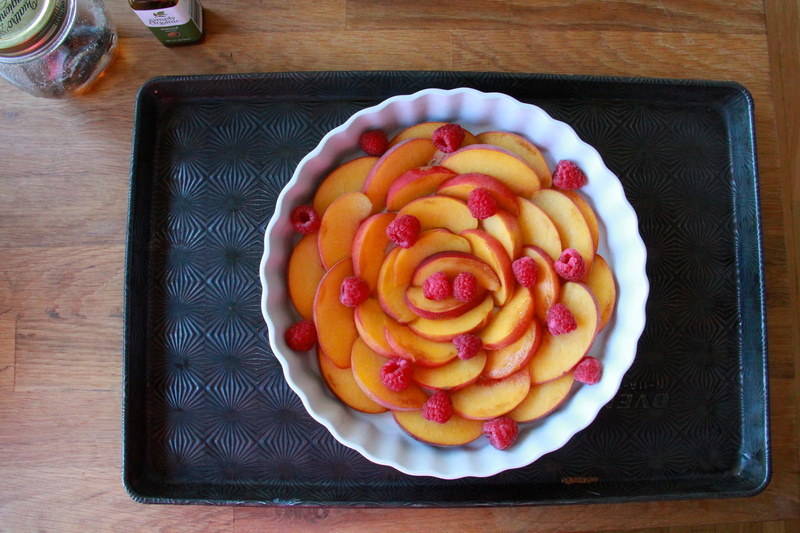 Arrange nectarine slices around a 9-inch baking dish (or pie plate) in a single layer — I created a big flower shape by placing the slices, skin-side out, in concentric circles at the bottom of the dish. 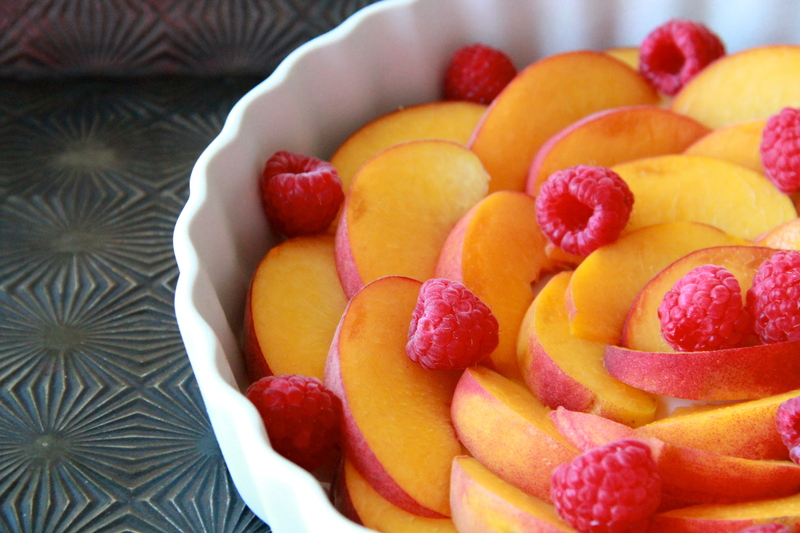 Toss the raspberries on top of the nectarines, arranging them to fill in any gaps. Place the baking dish on top of a sheet pan or cookie sheet. Carefully pour the custard mixture on top of the fruit, making sure the custard reaches every nook and corner. Bake the clafoutis until the very center is only very slightly jiggly, roughly 30-45 minutes (a toothpick inserted in the center should come out clean), making sure to rotate the pan halfway through baking. Allow clafoutis to cool for about 15 minutes, to give the custard time to set. Dust with confectioner’s sugar, if you like, and serve in wedges or big spoonfuls, either slightly warm or at room temperature. 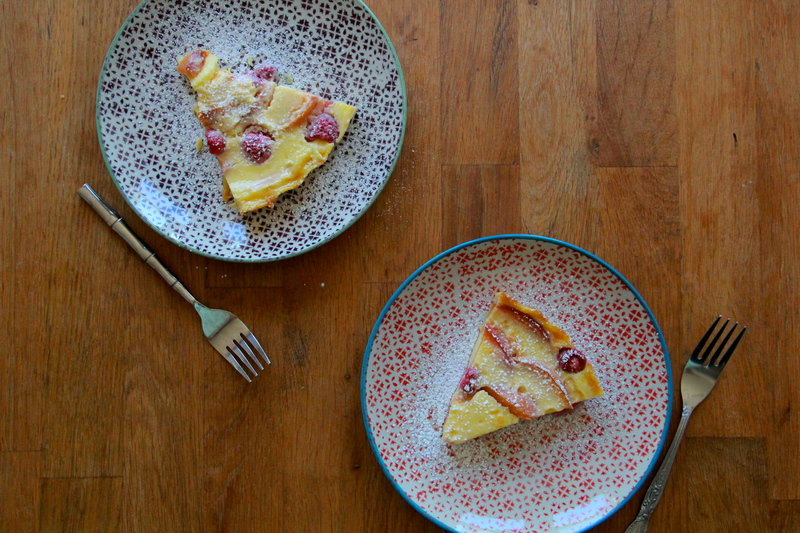 The clafoutis is best on the day it’s made, though it will keep (well-wrapped) in the refrigerator for 2 days.